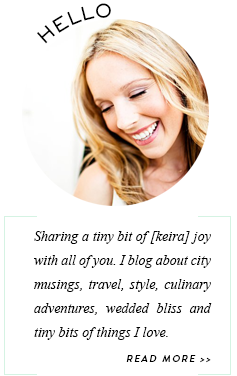 beautiful and inspiring blog Keira! Looking forward to keeping up on your expat adventures. Amsterdam has been on our list for awhile, but it might have to wait until spring or summer because I don't think I can go in the middle of winter. brrr. Already having trouble with the grey, cold days here in Zürich. ps - your wedding was gorgeous! Thank you so much!! Yeah, luckily we got nice weather that weekend but it's not so fun when its freezing...years ago I went to Prague, Budapest and Vienna in the dead of winter and it was frigid! Beautiful too though. Your blog is fab and I love reading it...it's so well laid out and your photos are amazing. Look forward to following your journey as well!